This is my kind of garden; in full bloom, and crammed with a splendid variety of pretty things. 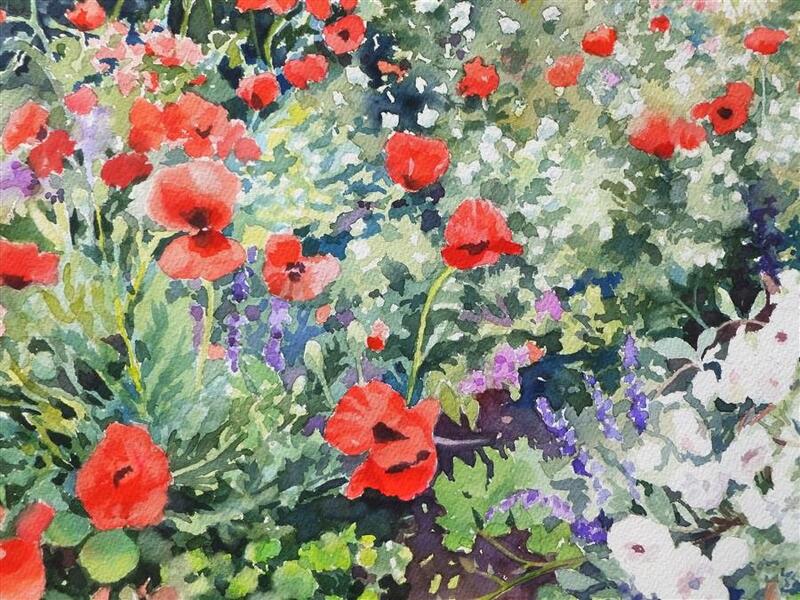 The subject matter delights me not only because I love gardens, but because it requires a lot of negative painting where I drop colors into the wet spaces and let the watercolor do its thing. 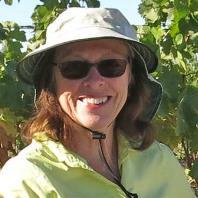 Although originally from the East Coast, Catherine McCargar has been a Californian for many years. 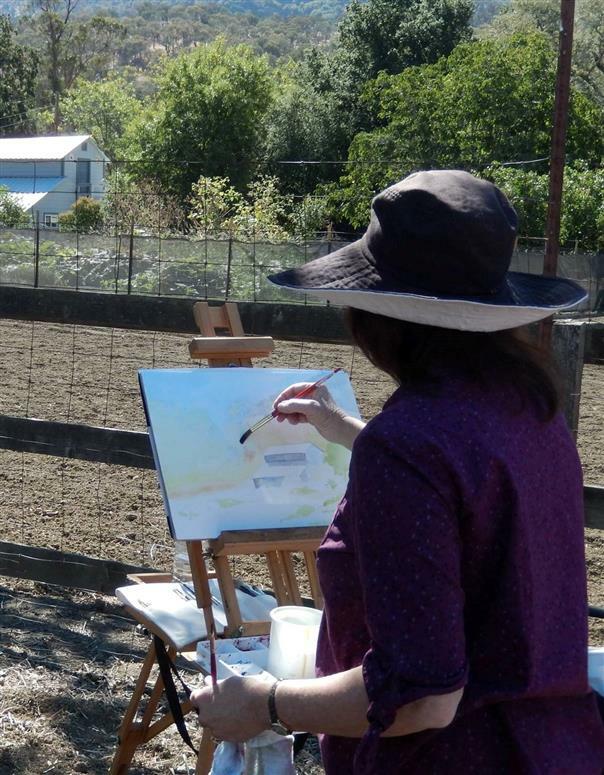 Her representative impressionism reflects the California landscape and her world travels. Throughout her portfolio, she creatively plays with her color palette, giving each work her distinct style. She paints regularly in her home studio, and has been a selected member of the San Francisco-based Jade Fon Painters group for over a decade. Through this, she has gained experience painting outside on location in all sorts of weather together with a group of accomplished artists. 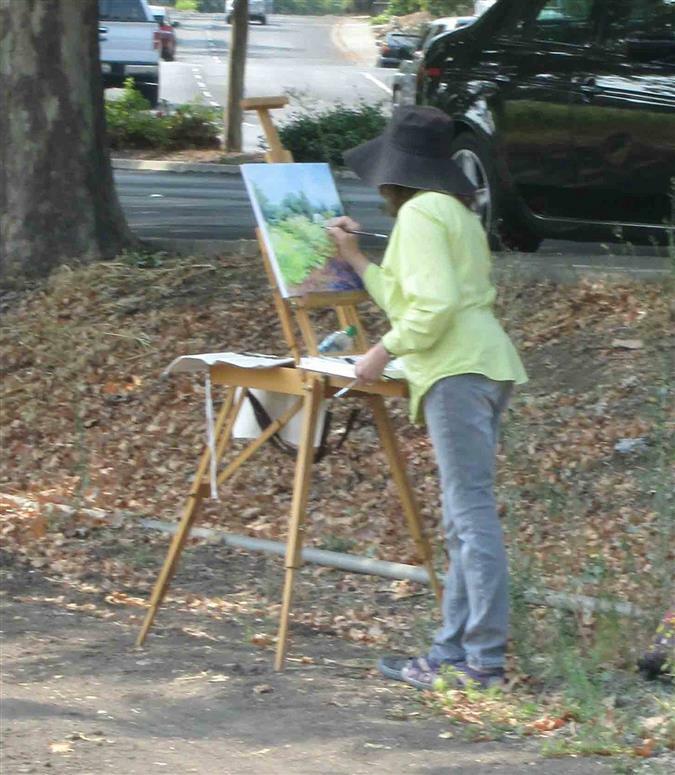 The experiences, observations, and critiques of that plein air group strongly influence her work today. Don, Thank you for your kind and encouraging words. I am so pleased that you are enjoying my paintings! Hope your remodel finishes up nicely...it is always such a great effort, and often, I think, more difficult than one imagines at the beginning. Good for you and your wife to be in the final stages! All my best wishes to you to find the perfect piece or pieces for your home's new look! Since your home is also in Walnut Creek, check out our local Valley Art Gallery's current show, "Art's Up." 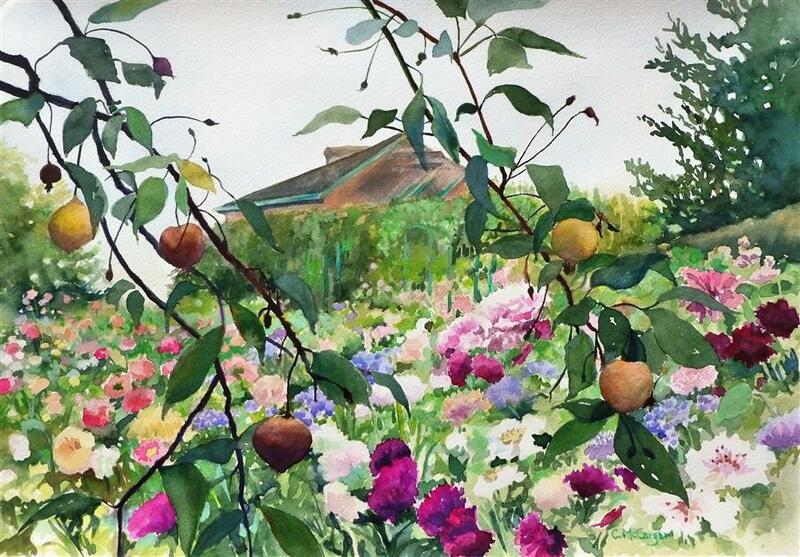 Several of my watercolors are on display there now. Cheers! Catherine, my wife and I are finalizing a year-long home remodel and currently searching for art to complement our wall colors and furniture, or the other way around! We have been scanning the UGallery site for ideas and happily discovered your gorgeous work! So beautiful! And it was particularly delightful to find we live in the same city! Keep up the incredible work! 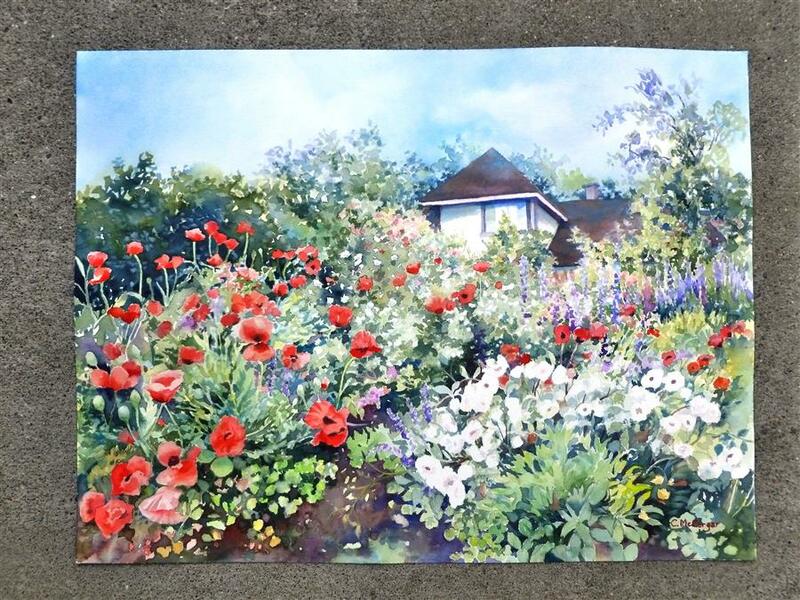 Hi Tina, I have a new painting, "Tending the Garden at Blake House, Kensington," on display now at Valley Art Gallery in Walnut Creek. It was selected to be part of the juried show, "Bay Area Life 2018", that is currently being exhibited there. In addition I have several other paintings that can be seen at that gallery. My blog site should keep you posted, cmccargarwatercolor.blogspot.com. Thank you so much for your interest in my work. It brings a smile to my face. Will you be displaying your work at any upcoming events in the East Bay? I am honored that two of my recent paintings were selected by juror Maria Medua of SFMOMA to be included in the show "Pleasing to the Palette, a Visual Feast" on display from June 30th to August 18th, at the Village Theatre Art Gallery in Danville, CA. If you are in the area, please come by and say hello at the opening reception, Friday, June 30th from 6-8 PM. Hydrangeas accenting the yellow Victorian will be beautiful. I will check into this, but you can get all your questions answered by clicking on "Commissions" on the UGallery home page and filling out the form there. The Ugallery staff will then guide you through the process. What do you charge to commission a painting? I would like it to be full sheet size and I would probably want to wait until spring when the hydrangea's are in bloom in front of the house. Do you have any paintings of the yellow Victorian house on the old lakeville highway in Petaluma? So good to know that you love the painting, and that it touches a chord with you of visits to your daughter and memories of the sights of San Francisco Bay. Thank you very much for sharing your satisfaction with us. It brings joy to an artist to know a painting is being enjoyed in its new home. This watercolor is so beautiful and I love it. My daughter lives in Sausalito and I have stood on this very spot at Fort Baker many times! Just want to say a warm "thank you" to the UGallery staff for their "curator pick" special recognition of my latest work "Green Valley Spring." I enjoyed painting it; so glad you like it. Thank you so much, I'm pleased you enjoy my work. Yes, I often work larger than the pieces that are currently on display at UGallery. I believe that a 24" x 48" watercolor painting would have to be produced from a roll of watercolor paper in order to get the long width. 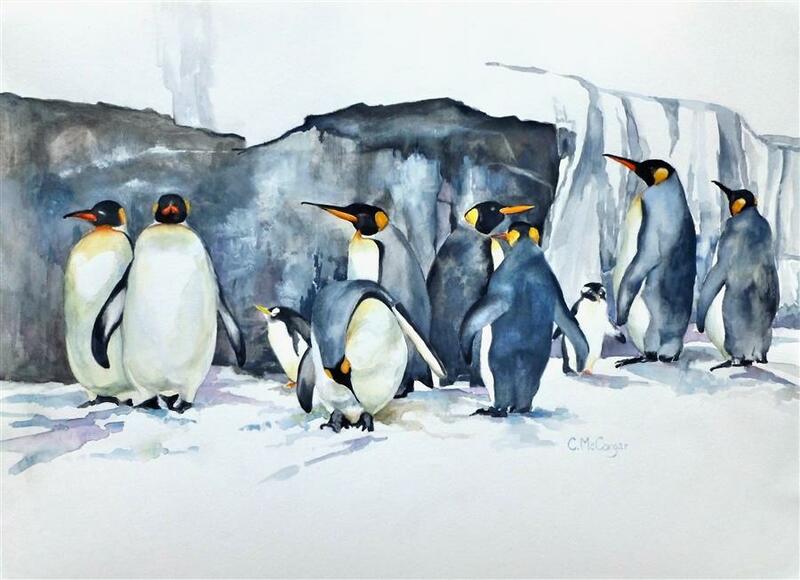 A standard full sheet of watercolor paper is 15" x 22". I have a landscape piece of that size in progress now. I have in my studio a number of finished pieces available in 18" x 24" size. The largest work I have done is 24" x 36", another paper size I found available. I used it for several commissioned pieces. I have purchased a piece of watercolor board, a nice firm surface, which is 30" x 40", and I am looking forward to working on it sometime soon. 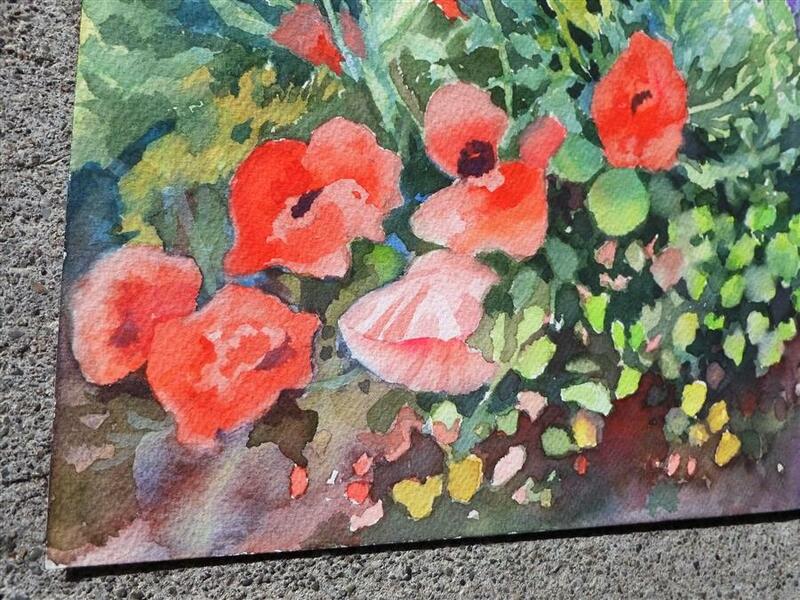 Remember that watercolor work usually is matted, and the mat adds significantly to the final framed size of a piece. I would love to know which of my paintings are you favorites. 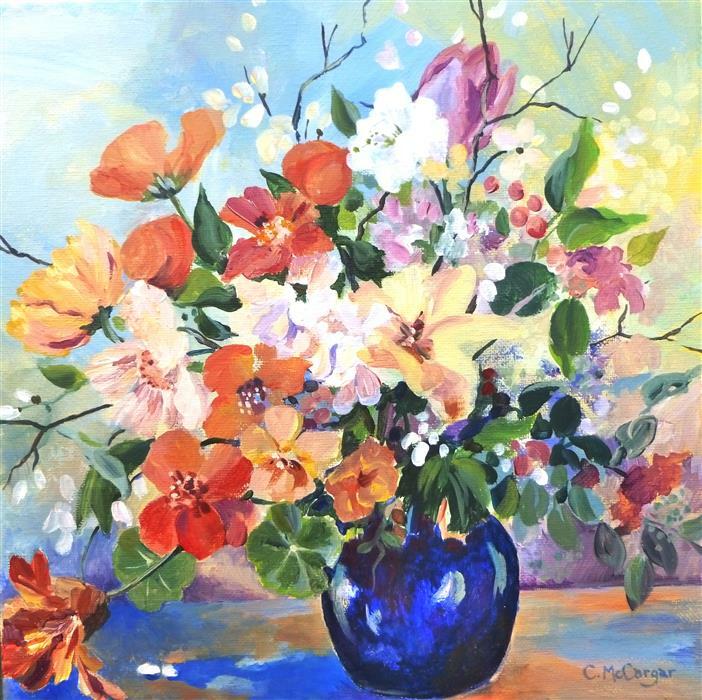 Catherine, do you do any larger pieces such as 24" x 48" for example? You are talented from toes to head. Thank you for your inquiry. The short answer is, I think, no, but I do have a couple of Petaluma (a small vineyard panorama, and one of cows!) in my studio. 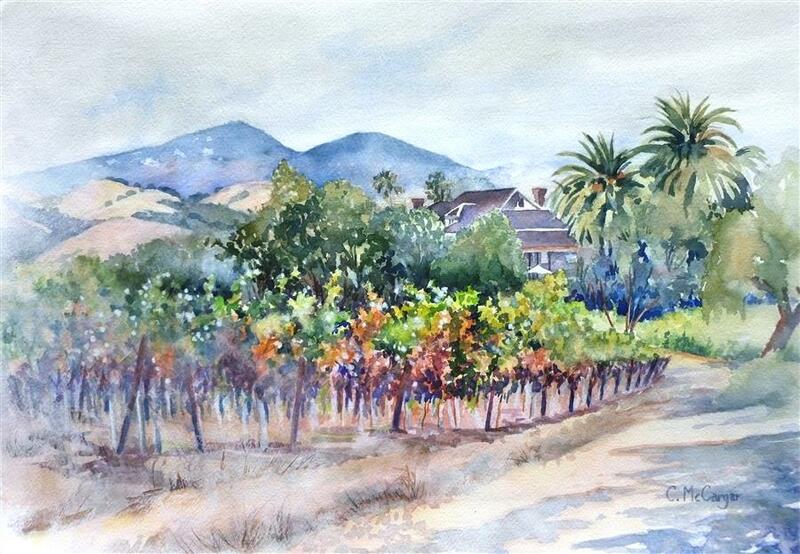 A new exciting larger vineyard piece called "Sonoma Red" is currently being exhibited in a national juried show, but scheduled to be returned to me on the 24th. 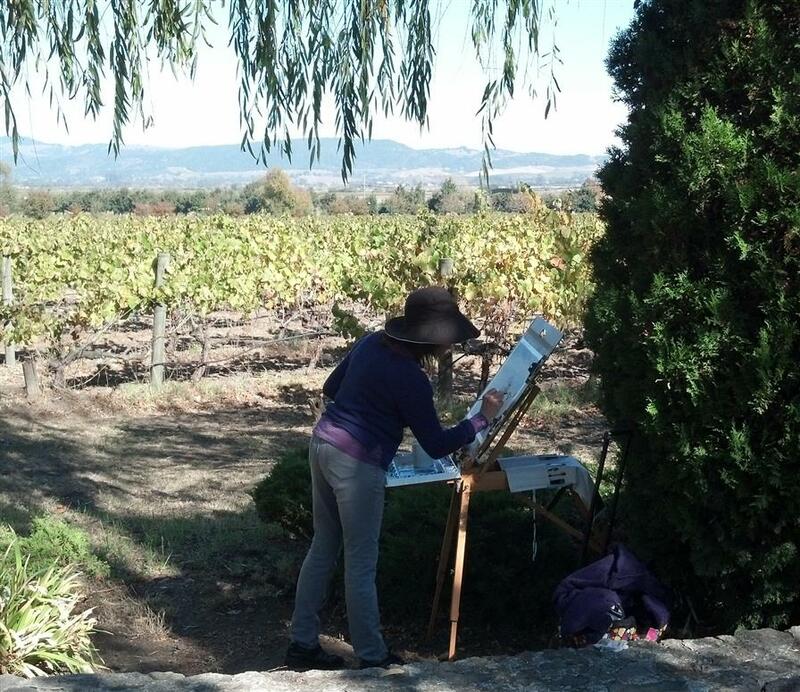 I love to paint these areas, and I don't live far from Napa, so I would consider doing a commissioned work for you. Alternatively, you can let me know what you would like to see, and I just might pop out there and post some new work for you later! I am so glad that you like my painting of Pillar Point Harbor. Maybe you know the coast around Half Moon Bay, and that it is often foggy there. I've done several paintings in the area, and they are all of misty scenes. I really like this painting - it captures the harbor and old pier on a rare sunny day as the fog creeps in. Thank you for your kind comment. The autumn scene there at the vineyard, with the fiery fall foliage was very inspiring. This piece was done by a very skilled artist. It is beautiful!